The Ironbridge Gorge Museums are introducing new packages and tours for groups planning to visit the Shropshire attractions during 2018. Ideal for groups looking to take in the beauty and splendour of the Ironbridge Gorge World Heritage Site with an expert guide, the WHS Tour starts at the Old Furnace in Coalbrookdale where Abraham Darby's revolutionary iron smelting technique kick-started the Industrial Revolution and changed the world forever. Then visit the newly refurbished Museum of Iron and discover how craftsmen made this the most famous iron works in the world. The tour continues with a drive through The Gorge to explore more of the industrial monuments in the area and a stroll across the Iron Bridge - an iconic symbol of the Industrial Revolution. Final stop is a visit to the Coalport China Museum to view the magnificent collections on display. 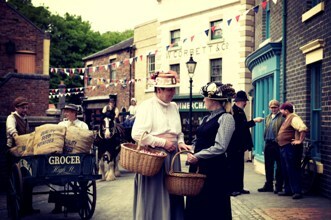 Groups booking the six-hour Very Victorian Tour will travel back over 100 years to experience the sights, sounds and smells of a former era at Blists Hill Victorian Town. Lunch can be enjoyed at one of the cafés or groups can tuck into some traditional Fish 'n Chips. This tour also includes a visit to the Museum of Iron and Jackfield Tile Museum. From 1st March until 31st October 2018 groups can spend the morning enjoying a relaxing cruise on the River Severn on board the Sabrina, Shrewsbury's acclaimed passenger boat, with live commentary and tea/coffee with biscuits, and the afternoon exploring Blists Hill Victorian Town. This package is just £16 per person but groups must book at least two weeks ahead and will need to use their own transport between the boat embarkation point and Blists Hill. These pre-booked packages are available to groups of 15 plus. There is free coach parking or a drop off facility at each museum; group leaders and coach drivers have complimentary admission and drivers will be given a free refreshment voucher.